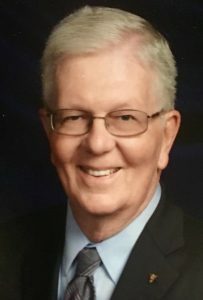 John William “Jack” Wall, 76, passed away peacefully at home, surrounded by family on Sunday, June 24, 2018. He had received Hospice care since March. His cancer diagnosis dated back to 1999. Jack was born December 14, 1941, in Cincinnati, Ohio to William George and Catherine Grady Wall. He graduated from Elder High School, attended University of Cincinnati, and was a graduate of the United States Military Academy, Class of 1966. He completed an MBA at Eastern Illinois University while living in Danville, Illinois. After graduation from West Point, Jack earned a Parachutist Badge and Ranger Tab before taking command of a Nike Missile Base in Dillsboro, Indiana. In Vietnam during 1969, he served as an Advisor with the South Vietnamese Army. He resigned with the rank of Captain in August, 1970. He was employed by Charmin Paper in Green Bay, Wisconsin; then Hyster Lift Truck in Danville, Illinois. Jack established an Edward Jones office in 1986, in Washington Court House, and retired as a Limited Partner in 2011, after 25 years with the firm. Jack was a member of St. Colman of Cloyne Catholic Church in Washington Court House where he served as a lector, Eucharistic minister, and helped with religious education. Jack volunteered with Little League as a member of the Washington Rotary Club. He was an avid fan of Washington Blue Lion sports spanning two generations of athletes. Jack was invited to serve on the selection committee for nominees to the military academies by State Representative David Hobson. Each August, Jack joined other Old Grads at West Point to accompany new Plebes on the March Back from Beast Barracks to begin their education at the Academy. This tradition provided many opportunities for mentorship. He was preceded in death by his parents, brothers-in-law James Doran, Frank Weisgerber, Ferdinand Flick, Daniel Sehlhorst and sister-in-law Kathleen Hartman Wall. Jack is survived by his wife, Mary Jo Nordmann Wall whom he married December 26, 1970; son, Gregory married to Christine, grandchildren Halli, John, and Maggi Wall, all of Washington Court House; daughter, Julie married to Charles Rea, grandchildren Elizabeth (Ellie) and Robert Rea, all of Chesterfield, Missouri; sister, Marilyn Doran and brothers, Daniel (Rita) Wall, Thomas Wall, Terry (Peggy) Wall; sisters-in-law, Linda Weisgerber, Donna Flick, and Diana Sehlhorst, all of Cincinnati, Ohio; and many nieces and nephews. Visiting hours will be held Sunday, July 1, 2018, from 4-8 p.m. at the St. Colman of Cloyne Catholic Church in Washington Court House. A prayer service will begin at 8 p.m. Sunday at the church with Deacon Reed Hauser presiding. The funeral mass will be celebrated Monday at 11 a.m. at the church by the Reverend Father Michael Hartge, parochial vicar administrator. Immediately following the mass, full military honors will be bestowed by the Fayette County Honor Guard. Cremation will then follow with inurnment of cremains at a later date at the West Point Cemetery. In lieu of flowers, the family requests memorial contributions to Saint Colman of Cloyne Catholic Church or the St. Vincent de Paul Society, both at 219 South North Street; Ohio Hospice of Fayette County, 222 North Oakland Avenue, Washington Court House, Ohio 43160; or online at James Fund for Life at the James Cancer Hospital at The Ohio State University. Arrangements are under the direction of Kirkpatrick Funeral Home in Washington Court House. the relationship and feelings you had with Jack. I hope you remember the Best Memories of the times you spent together over the years.